At Least 12 Dead After Truck Driven Into Berlin Christmas Market, Police Say : The Two-Way German police said at least 12 people were dead and at least 48 people were injured. Police said a possible suspect was in custody. 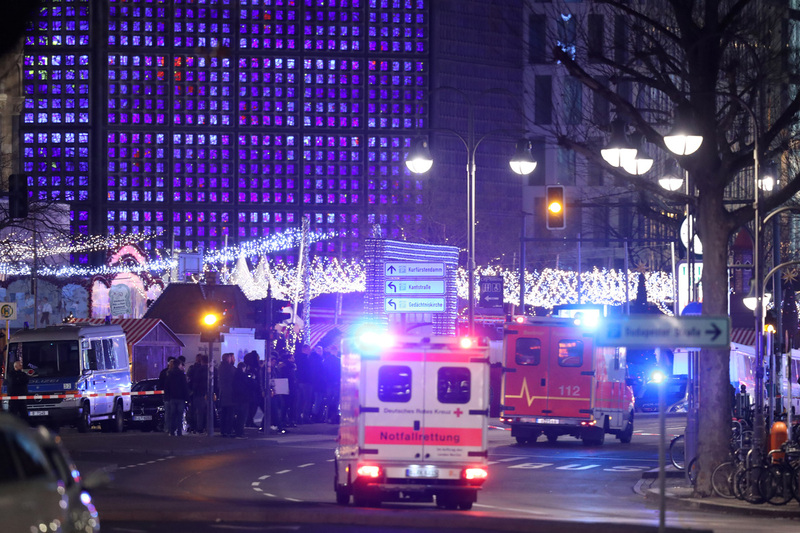 An ambulance and rescue workers arrive on the scene after someone drove a truck through a Christmas market in Berlin on Monday. German police said at least 12 people were killed and at least 48 people were injured after a truck barreled into a packed Christmas market in Berlin. Just now a truck drove over the sideway at #Breitscheidplatz. Our colleagues report injured people. More information here. 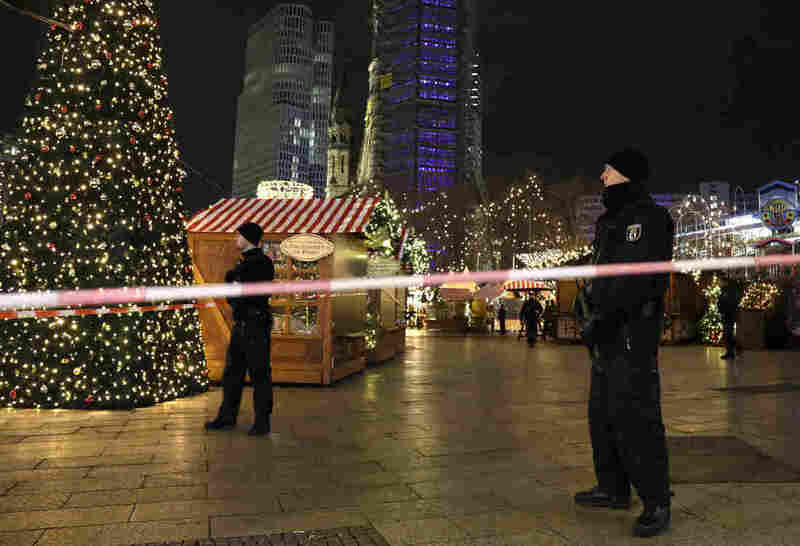 The truck was driven into the crowd on a sidewalk, bringing down Christmas lights and smashing stalls at the festive market near the Gedaechtniskirche, or Memorial Church, in western Berlin. The black truck had Polish license plates. Dozens of ambulances and hundreds of rescue workers were on the scene, NPR's Soraya Sarhaddi Nelson reported. Police survey the area after someone rammed a truck into a crowded Christmas market in Berlin on Monday. A "suspicious person" was arrested nearby, police said, adding that "whether it is the driver of the truck, is currently under consideration." In a separate tweet, they said that "the passenger of the truck, who drove to the Christmas market ... died on the spot." Police did not elaborate further on the relationship between the person who died on the spot and the person who was arrested. It is not clear how many people were in the truck. Germany's federal prosecutor general has taken charge of the investigation, according to Deutsche Welle. Federal prosecutors "handle terrorism cases," The Associated Press reported, though authorities have not officially characterized the incident as an attack. They have stressed that it could be an accident, Soraya added. U.S. National Security Council spokesman Ned Price said in a statement that the incident "appears to be a terrorist attack." In a statement about the incident, President-elect Donald Trump called it a "terror attack" and said: "ISIS and other Islamist terrorists continually slaughter Christians in their communities and places of worship as part of their global jihad. These terrorists and their regional and worldwide networks must be eradicated from the face of the earth, a mission we will carry out with all freedom-loving partners." The truck involved was registered to a Polish haulage company, Soraya reported, citing Polish media reports. "And the owner, who spoke to Polish radio, said his cousin had actually been driving to Berlin in this truck," she added. Police have asked residents to avoid the market area, stay indoors and not spread rumors. "We heard a really loud bang and saw some of the Christmas lights to our left starting to be pulled down," witness Emma Rushton told Sky News. "And then we saw the articulated vehicle going through people and through the stalls and just pulling everything down. And then everything went dark." A video apparently shot at the market after the incident and posted on Facebook by the Berliner Morgenpost newspaper appeared to show sidewalk kiosks damaged and flattened, and rescue workers and police on the scene. Sirens blared in the background. Last month the U.S. State Department warned of a "heightened risk of terrorist attacks throughout Europe, particularly during the holiday season." It added that "credible information" indicates that ISIS and al-Qaida "continue to plan terrorist attacks in Europe, with a focus on the upcoming holiday season and associated events." Christmas markets such as this one are extremely popular in Germany and are taking place under heightened police presence, Soraya said. "They start about four weeks before Christmas. You have to picture little huts, with all sorts of handicrafts, and they sell all kinds of foods and of course the very famous Glühwein, or mulled wine, which is the most popular drink that you would get there," she added. "It's just a fun place for family and friends to get together." This is a developing story. Some things that get reported by the media will later turn out to be wrong. We will focus on reports from police officials and other authorities, credible news outlets and reporters who are at the scene. We will update as the situation develops.